In honor of Black history month, my friend Robert prepared the following dish for this month's Chef Spotlight dinner where we highlight African American chefs. This recipe comes from Marcus Samuelsson. After their birth mother died in a tuberculosis epidemic when he was three years old, Kassahun Tsegie and his elder sister, Fantaye, were adopted by Ann Marie and Lennart Samuelsson, who lived in Sweden. The siblings' names were changed to Marcus and Linda Samuelsson. After becoming interested in cooking because of his maternal grandmother in Sweden, Samuelsson studied at the Culinary Institute in Gothenburg, where he grew up, apprenticed in Switzerland and Austria, and came to the United States in 1991 as an apprentice at Aquavit. At 24, Marcus became executive chef of Aquavit, and soon after that also the youngest ever to receive a three-star restaurant review from The New York Times. 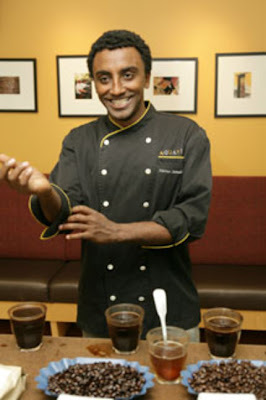 In 2003 he was named "Best Chef: New York City" by the James Beard Foundation. The same year he started a second New York restaurant, Riingo, serving Japanese-influenced American food, and published his first book in English. Samuelsson is an adjunct professor in meal sciences at Umea University in Sweden and he has a television show, "Inner Chef," on Discovery Home Channel. His cooking combines international influences with traditional cuisines from Sweden to Japan and Africa. Salt and pepper to taste Marinate the chicken in 1/4 cup of the rum, 1/2 cup of the olive oil, jalapenos, and the crushed Szechuan pepper seeds for 1/2 hour. Meanwhile, heat 2 tablespoons of the olive oil and 1 tablespoon of butter in a pan. Sauté the sliced onion, quartered garlic cloves, potatoes, parsnip, carrots and thyme over medium heat for 6 minutes. Add 1 teaspoon of the Garam Masala, honey, cardamom, 2 teaspoons of the Berbere, and the peanuts. Sauté for another 6 minutes, then remove from the pan. In the same hot pan, brown the remaining oil, garlic, onion, ginger and Berbere for 7 minutes over low heat. Add the chicken, brown, and season with salt and pepper. Cover with the water, red wine, remaining rum, and coconut milk. Simmer for 20 minutes and season again with salt and pepper. Put the vegetables back in the pot, heat through. Serve on top of the soft flat bread, drizzle with the oil, and garnish with cottage cheese. Wow! A dish of truly global flavors: Szechuan pepper seeds, garam masala, berbere, red wine and coconut milk - it's like international travel via your dinner plate! Sorry, forgot to say that I'd never heard of Berbere before today. How funny that I'd see it twice. I really think his life experience and ideas in food are fascinating. This looks like a great dish.